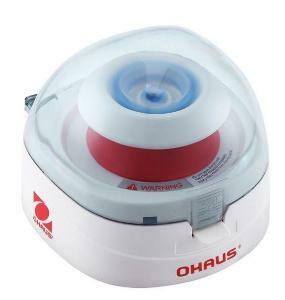 The Ohaus Frontier 5306 is a small but powerful minicentrifuge for simple and quick liquid separation. With an eight-place, 1.5 mL tube rotor, Frontier 5306 can accommodate 0.2 mL eight-strip tubes or 32 individual PCR tubes. With the included adapter, 0.2 mL and 0.5 mL tubes can also be accommodated in the eight-place tube rotor. Operation is quiet, easy, and safe, making this centrifuge perfect for spin-down applications.